JOHANNESBURG (Reuters) - Surfers around the world may complain about crowded conditions, but for dozens of South Africa wave riders it was the more the merrier as they lined up to break a world record by riding a single wave. 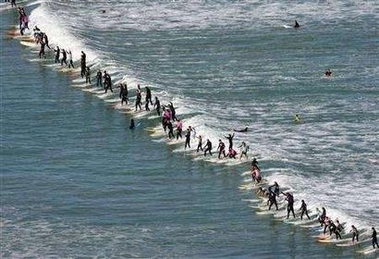 Organisers of an event on Sunday that saw 73 surfers -- ages 7 to 67 -- ride the same wave for five seconds say they broke a Guinness Book of Records best of 44 people in Ireland. More than 1,000 onlookers watched from the beach near Cape Town and videographers documented the stunt, but the results have yet to be officially verified.